Will Minnesota's Lackluster Summer Lead to Success in 2015? Will Minnesota’s Lackluster Summer Lead to Success in 2015? It’s been four months since the Minnesota Wild were swept out of the playoffs by the Chicago Blackhawks. Chicago eliminated Minnesota the previous two years as well, but this time was different. This time, the Wild looked like they had a chance to make it farther than the second round; to finally beat the Blackhawks in the playoffs. As we all know, the Wild lost in disappointing fashion – eliminated without a single win in the second round. 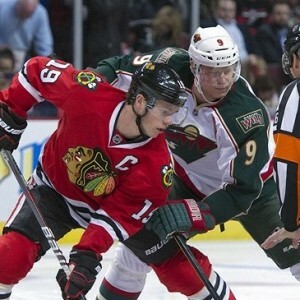 In those four losses, the Wild managed to score only seven goals, while Chicago scored almost double (13). At this point, you may be wondering why I’m bringing this up four months later. It was horrible and depressing and nobody wants to talk about it anymore. But bear with me; I do actually have a point. The point is, the Wild lost in the playoffs not because they weren’t a talented team, but because of their lack of offense. Chicago has goal-scoring superstars like Jonathan Toews, Patrick Kane, Marion Hossa, etc, while the Wild really doesn’t have anyone like that. And after four months of summer, the Wild still doesn’t have anyone similar. After watching Minnesota play in last season’s playoffs, it was clear this team needed a goal scorer. While other teams scored with ease, every goal was precious for the Wild. Minnesota scored 227 goals this season, coming in behind teams like Anaheim, Detroit, Dallas and Vancouver. These are teams that the Wild need to be able to compete with, and the roster they have now just doesn’t seem capable. It seemed pretty logical that GM Chuck Fletcher would’ve made it a priority to acquire a goal scorer for his team this season. Some might argue that goaltending is more important, and Fletcher accomplished a huge task by signing Devan Dubnyk long-term. While this is true, and the Wild are lucky to have a quality goaltender in net this season, last season proved that it’s impossible to win games based on great goaltending alone. Dubnyk could stand on his head every night, but if his teammates in front of him couldn’t put pucks in the opposing net, it wouldn’t matter. I’m not implying the Wild are completely inept at scoring goals, but they do lag behind other teams in the division. Chicago has Kane and Toews; St. Louis has Vladmir Tarasenko, who could probably take down the Wild by himself; and Dallas spent the offseason acquiring big-name players like Johnny Oduya and Patrick Sharp to add to their already talented lineup. The Wild, however, have the exact same roster now as they did in May, with the exception of Mike Reilly. Fletcher spent the rest of the summer signing Mikael Granlund and Erik Haula to contract extensions, which is good, as either of these two could break out this season, but that seems pretty unlikely. Minnesota has a talented group of players, but very few of them look like they could become a Tarasenko- or Toews-like player for the Wild. The Western Conference is becoming stronger every year, and the Wild aren’t going to be able to slide by without solid offense for much longer. If Fletcher is waiting for guys like Thomas Vanek, Jason Pominville or Mikko Koivu to become the Wild’s superstar, he’s going to be waiting a very long time. The Minnesota Wild need a star that can give them the offense to truly compete with teams like Nashville, St. Louis and Chicago, and to finally make it deep into the postseason. Sometimes finding this star means taking a risk. Take the Montreal Canadiens, for example. The Canadiens recently signed Alexander Semin to a one-year deal, which could be a disaster, but at least GM Marc Bergevin is trying to make improvements. Free agents can be hit or miss – as the Wild are well aware – but at least they provide something different. This offseason was the time to acquire or trade for someone like that. While Fletcher did indeed do a few things that will no doubt help the Wild, I don’t think it’s going to be enough to significantly make a difference this season. Re-singing Granlund and Haula isn’t going to lead this team to the Cup. It’s better than having neither of them signed, but this team needs a little something more to take them to the next level. If the Wild want an outcome different from last season’s ending, someone is going to have to step up. What do you think? Are the Wild good enough without a big-name goal scorer, or should Fletcher have added someone else?